Let’s start with the given that lightning is dangerous, and the distinct possibility that photographers are stupid. Combining the two is a recipe for disaster. Add a shear, one-mile deep canyon with lots of exposed outcrops and…, well, you get the idea. Okay, seriously, lightning is both dangerous and unpredictable. Before attempting anything that requires you to be outside during an electrical storm, it behooves you to do your homework: the more you understand lightning, and how to stay safe in its midst, the greater your odds of enjoying the fruits of any attempt to photograph it. Not only will understanding lightning improve your safety, it will also help you anticipate and capture lightning. Lightning is an electrostatic discharge that equalizes the negative/positive polarization between two objects. (When you get shocked touching a doorknob, you’ve been struck by lightning.) The cause of polarization during electrical storms isn’t completely understood, but it’s generally accepted that the key factor is the extreme vertical convective air motion within a thunderstorm (convection is up/down circular flow caused when less-dense warm air rises, becomes more dense as it cools, and falls; convection is also what causes the rising bubbles in boiling water). Convection carries positively charged molecules upward and negatively charged molecules downward. Because opposite charges attract each other, the extreme polarization (positive charge at the top of the cloud, negative charge near the ground) is quickly (and violently) equalized: lightning. With lightning comes thunder, the sound of air expanding rapidly (exploding) when heated by a 50,000 degree by lightning bolt. The lightning that caused the thunder travels to you at the speed of light, over 186,000 miles per second (virtually instantaneous regardless of distance). But thunder, traveling at the speed of sound (a little more than 750 miles per hour—a million times slower than light), takes its time. Knowing that the thunder occurred with the lightning flash, and how fast it travels, we can compute the approximate distance of the lightning strike. At 750 miles per hour, thunder will travel a mile in about five seconds. Dividing the time between the lightning’s flash and the thunder’s crash by five gives you the lightning’s distance in miles; divide the interval by three for the distance in kilometers. If five seconds pass between the lightning and the thunder, the lightning struck about one mile away; fifteen seconds elapsed means it’s about three miles away. The 30 people killed by lightning in the United States each year had one thing in common: each didn’t believe he or she would be struck by lightning when they started whatever it was they were doing when they were struck. The only sure way to be safe in an electrical storm is to be in a fully enclosed structure or metal vehicle, away from open windows, plumbing, wiring, and electronic devices. Unfortunately, photographing lightning requires being outside. While there’s no completely safe way to photograph lightning, it doesn’t hurt to improve your odds of surviving to enjoy the fruits of your labor. Most lightning strikes within a six mile radius of the previous strike. So, if less than thirty seconds elapses between the flash and bang, you’re too close. And since “most” doesn’t mean “all,” it’s even better to allow a little margin for error. Thunder isn’t usually audible beyond ten miles—if you can hear the thunder, it’s safe to assume that you’re in lightning range. Photographing lightning at night is mostly a matter of pointing your camera in the right direction with a multi-second shutter speed and hoping the lightning fires while your shutter’s open—pretty straightforward. Photographing daylight lightning is a little more problematic. Without a lightning trigger to recognize lightning and click your shutter, success is largely dumb luck (few people are quick enough see it and click). So just what is a lightning trigger? I thought you’d never ask. A lightning trigger is a device that attaches to your camera’s hot shoe and connects via a special cable to the camera’s remote release jack. When engaged, it fires the shutter immediately upon detecting lightning. There are many lightning triggers from which to choose. I went with the one that was the consensus choice among photographers I know and trust: Lightning Trigger from Stepping Stone Products in Dolores, CO. At slightly less than $400, it’s far from the cheapest option, but from all I’ve read, heard, and now experienced, these aren’t generic products and the internal technology matters a lot. No regrets so far. I won’t get into lots of specifics about how to set up the trigger because it’s quite simple and covered well in the included documentation. You should know that connecting it does disable the LCD replay, so you won’t be able to review your captures or histogram without disconnecting it (a simple but inconvenient task). The Lightning Trigger documentation promises at least a 20 mile range, and I saw nothing that caused me to question that. It also says you can expect the trigger to fire at lightning that’s not necessarily in front of you—I can attest to that too. For every click with lightning in my camera’s field of view, I got at least five clicks with no visible lightning. For most of my Grand Canyon trip I was waiting for lightning that appeared in the direction my composition, perhaps 5 to 15 miles distant, about one bolt every 15 or 20 minutes. In other words, these weren’t particularly active storms with multiple flashes per minute. When lightning did fire in my composition, I estimate that the trigger clicked the shutter at least 95 percent of the time (that is, even though I got lots of false positives, the trigger missed very few actual strikes). Of these successful clicks, I actually captured lightning in about 2/3 of the frames. I suspect that the misses were more a function of the lightning itself that a problem with the trigger or camera—some flashes are single strokes that finish far too quickly for capture. In general, the more violent the storm, the greater the likelihood of bolts with long duration, multiple strokes that are easier to capture. The Lightning Trigger documentation also recommends shutter speeds 1/20 second or longer—faster shutter speeds risk completing the exposure before some or all of the secondary strokes fire. To achieve daylight shutter speeds in the 1/20 to 1/4 second range, I shot in manual mode, using a polarizer, at ISO 50 and f16. The exposure will vary with the amount of light, so your settings will vary. You can also use a neutral density filter to slow the shutter speed. Because shutter lag (the time elapsed between the click of the shutter button and the shutter opening) is death to lightning photography, you’ll need to turn off autofocus. Even though I use back-button focus, Canon says simply having autofocus on initiates a brief communication between the lens and camera that very slightly delays response (I can’t speak for Nikon). If you must autofocus, go ahead and do it each time you recompose, then turn autofocus off as soon as you’re focused. Similarly, despite what the Lightning Trigger documentation suggested, I used manual exposure mode to eliminate any camera-slowing metering when the shutter trips. And, also despite what the Lightning Trigger documentation suggests, I didn’t worry about my noise reduction settings. Canon assures (again, I can’t speak for Nikon) that noise reduction is a post-capture function that might slightly delay continuous frames, but it won’t increase shutter lag. In addition to a lightning trigger, you’ll need a solid tripod and, ideally, a camera with a shutter lag faster than 60 milliseconds. Slower shutter lag won’t shut you out completely, but it will reduce your success rate. The Lightning Trigger website has a good, albeit somewhat dated, camera shutter-lag table. I’m a Californian, which means lightning is a novelty for me. Nevertheless, a few months ago I purchased my Lightning Trigger, which has since been collecting dust. 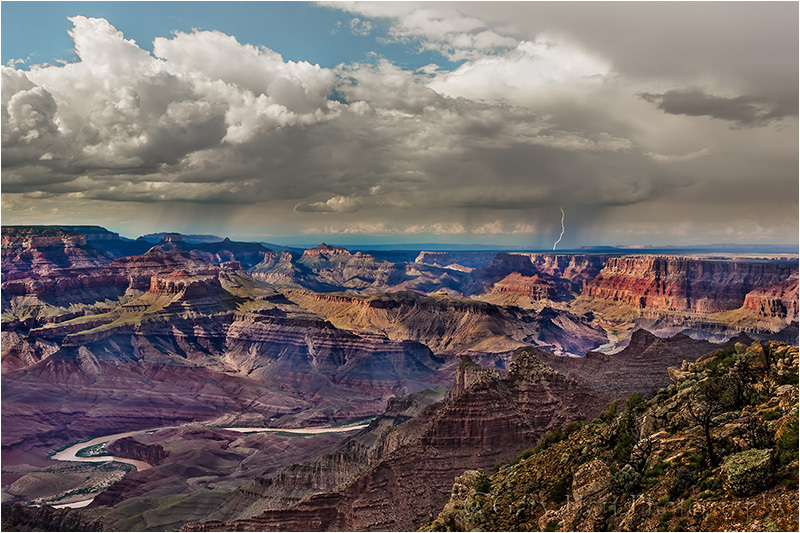 Because the lightning wouldn’t come to me, I decided to go to the lightning—in this case that meant a twelve hour drive to the Grand Canyon, in the heart of monsoon season, with my friend and fellow pro Don Smith. Our plan was to find a location with an open view of the canyon and that allowed us to set up our cameras within sight of the car (so we could safely wait out the storms). Based on previous visits, we thought Lipan Point would be a good spot and started there, but we hadn’t anticipated the crowds we’d encounter. We also quickly realized that it’s pretty unrealistic to expect to photograph lightning in the midst of the storm—not only is it dangerous, the heavy rain risks damaging equipment, dots lens elements with raindrops, and pretty much obliterates any view. So in very short order we went to Plan B: Wait until the cell passes and photograph more distant storms. The open views at the Grand Canyon are ideal for this and served us well. Don and I quickly learned that the lightning is most likely to strike within or near the gray curtains that are clearly recognizable as distant rain. The wider the composition, the greater your odds of capturing lightning, but the smaller it will appear in your image. My general approach was to identify the most likely lightning source (rain curtain) and find the best composition that included it. I tended to start wider to ensure success, then tighten my composition once I was fairly confident I had something. I also recommend that you don’t check your captures until you’re done (or better yet, until you upload your images to your computer). Since viewing the LCD requires disconnecting the trigger, doing so risks missing a shot; you’ll also find that many successful captures, especially wide compositions, just aren’t that visible on an LCD viewed in daylight. Be aware that electrical storms can move quite quickly, so you need to monitor them closely. Sometimes this simply means adjusting your composition to account for shifting lightning; other times it means retreating to the car if the cell starts to threaten your location. Also be aware of the height from which the lightning originates and be sure to include enough cloud to get all of the stroke. The above image of a single bolt striking the Painted Desert east and north of Desert View, as viewed from Lipan Point, was one of my first captures of the trip. I was composed quite wide to ensure capturing something (because I was so wide, I cropped it a little in Photoshop). Over a one hour period I actually got four strokes in some variation of this composition, but this was by far the brightest. this is a great capture!! Beautiful–I (by chance) caught a lightning strike in yosemite during one of your workshops May 2011. We were shooting Bridal Veil Rainbows and when I started PP I noticed a strike at the top of the peaks above Waterfall. Just luck for me. That’s pretty cool, Donna–I’d like to see that.